Jessica Sherrill is the General Counsel of Oklahoma City Public Schools. She attended the University of Oklahoma (Bachelors of Arts in psychology - 2004) then went on to Oklahoma City University School of Law (Juris Doctor - December 2006). She was sworn in as an attorney in April of 2007. Jessica is a proud second-generation Rotarian; her late mother, Rebecca Walls, was a member of the Oklahoma City Northwest Rotary Club for nearly 21 years. Jessica followed her mother’s footsteps into Rotary when Megan Law, Past District Governor, asked her to visit the newly-forming Midtown OKC Rotary Club. Shortly after having her son in 2009, Jessica transferred her Rotary membership to the Oklahoma City Northwest Rotary Club. This was a comfortable fit given that she had known the Rotarians there for so many years and had already volunteered alongside her mother in their service projects. 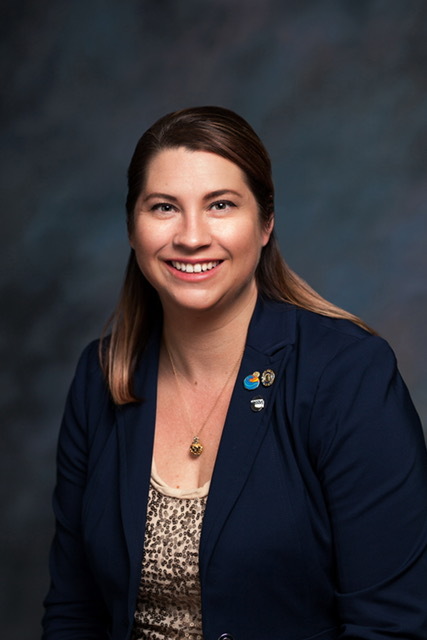 Jessica served as Membership Chair, Club Secretary, High School Rotarian Program Chair, Four Way Test Chair, Rotaract Chair, and President (2012-2013) and was selected as the club’s Rotarian of the Year (2011-2012). During her President year, the club was recognized with a Silver level District Governor’s Citation award. On the district level, Jessica served first as a judge in the Four Way Test Speech contest, and then became the district chair of that speech contest before becoming the current District Membership Chair. She is a Paul Harris Fellow +6 and was recognized by PDG Michelle Schaefer with Light of Rotary and Women in Rotary Awards. Jessica is also a Rotary Leadership Institute graduate and facilitator. Visiting Rotary clubs and meeting Rotarians became such a pleasure to Jessica that she developed a desire to return to the club that first got her started - Midtown OKC Rotary Club - which welcomed her back with open arms. Jessica is Past President of the Oklahoma Association of School Board Attorneys and has been on that board since 2010. She is a member of the Oklahoma Bar Association, National Council of School Attorneys, and the National Association of Unemployment Insurance Appellate Professionals. Jessica is a graduate of Leadership Oklahoma City’s LOYAL Class III and enjoys mentoring and promoting leadership to high school and college students. She volunteers mostly through Junior Achievement OKC and has served on the advisory board Alpha Chi Omega's OU (Psi) and OCU (Gamma Tau) chapters. She is also a board member for Rollingwood Elementary PTO. Jessica is married to her college sweetheart, Jay, who works for Quest Diagnostics. Jay is also a school board member and Past President for Putnam City Public Schools. Together, they have a son named Hill, age 9, and a daughter named Ainsley, age 4, and a rescue dog named "Link," age 2. The Sherrills enjoy travel, finding fun, and giving back to their community. Jessica encourages you to include Rotary in your family and your family into Rotary. What a wonderful legacy of Service Above Self to pass on from one generation to the next!